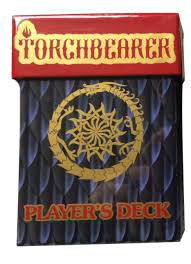 For use with the Torchbearer roleplaying game, this deck contains everything a player needs to survive the harsh environs of the dungeon! The deck consists of 42 cards in a heavy duty slipcase box. In addition, the box contains two separator cards to help you better organize your deck.